SDL BeGlobal is a hybrid translation service, offered as a cloud based (SaaS) product, that combines statistical machine translation with translation memory, along with human review and post-editing. This enables customers to translate large volumes of material at a high quality level. BeGlobal, which is derived from Language Weaver’s machine translation technology (acquired by SDL several years ago), is a statistical machine translation system, the same technology that powers Google Translate and Microsoft Translator. Statistical machine translation systems are trained by feeding them large volumes of parallel texts (texts that have been translated into another language). This enables them to translate between any two languages for which there is a good supply of training texts (which thanks to the web, are no longer in short supply). BeGlobal supports a broad range of languages throughout the Americas, Europe, Asia and the Middle East (list). BeGlobal differs from Google and Microsoft because the translation engine, while it can be used as a stand-alone product, can also be integrated into SDL’s translation memory and translation management systems (World Server). The system pre-translates documents using machine translation, as well as translation memory (which matches existing human translations against the text). This pre-translation is then reviewed and edited by human translators. Because this significantly reduces the amount of work needed, a translator can process a much larger volume of text in a given time, which effectively reduces the per word cost of translation. SDL cites TripAdvisor reviews as an example of content that would not be economical to translate using human translators. TripAdvisor reviews are machine translated by BeGlobal and displayed as a convenience for non-English speaking customers, who can toggle between English and machine translated reviews. For content that requires more editing, they can review and post-edit machine translations (for listings for example). Live chat and email is another example where machine translation works well. For live chat, finding human translators who are available at the exact time two parties wish to communicate is a real challenge, one that MT alleviates. 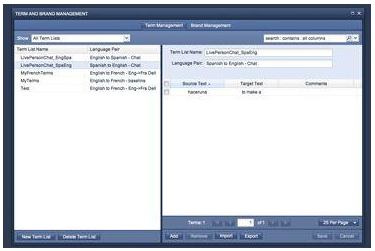 For email, MT can be used in conjunction with a pool of human translators (SDL provides an email translation service similar to PostLingo that is integrated with Microsoft Exchange). BeGlobal is offered as a SaaS solution, with pricing that scales along with usage and the number of language supported, making it accessible to companies ranging from small/mid sized businesses to multinational enterprises. The translation engine can be used as-is, but it can also be trained with the customers own aligned texts (source and translated texts), so that it learns to translate in the customer’s vocabulary and house style. Customers who want to incorporate machine translation or hybrid machine/human translation into their product or service. This is particularly useful for services that have a large number of listings (travel sites, online stores), lots of dynamic content (user reviews and comments). You can then use this to pre-translate all of your content, and then have people clean up and fine tune the machine translations as needed, for the most visible listings for example. AsiaOnline also offers a highly customizable and trainable machine translation platform with similar features to BeGlobal. Other services such as Google Translate and Microsoft Translator, while they offer good quality machine translation, do not provide the type of integration with human translation tools that SDL does. This entry was posted in APIs, document translation, hybrid translation, machine translation, translation management systems and tagged beglobal, engine, google, language, languageweaver, machine, microsoft, mt, sdl, tms, translation, weaver, worldserver. Bookmark the permalink.